When Bali the demon king, was celebrating the occasion of his conquest over the gods, in the gathering were present a large number of hermits and Brahmins. Vamana, the dwarf incarnation of Vishnu also joined them. When his turn came, he prayed Bali to grant him a piece of land measuring three strides as alms. Bali's teacher Shukracharya warned him against granting the request but Bali paid no heed and granted it. He asked Vamana to measure it. Vamana expanded his body to such size that in two steps he covered the entire earth, heaven, and Patala, and asked the demon king for the space to put his third. Bali, true to his words, presented his head and asked Vamana to put it there. Vishnu placed his foot on his head and pushed him into the Patala and thus, gods' position and power were restored. Here in this painting we can see Bali pouring sacred water onto Vamana's open palms, solemnizing his promise to garnt the desired amount of land. Behind Bali stands his teacher Shukracharya, making a gesture as if to point out Balis folly in making the promise. Next to the teacher is a typical demon, pointing out to us that notwithstanding his 'normal' appearance here, Bali is essentially a demon-king. Behind the green demon is the throne which Bali has vacated to pay his respects to the the Brahmin guest. Noteworthy are the strange legs of the throne, slitheirng outwards, mouthed like serpents. 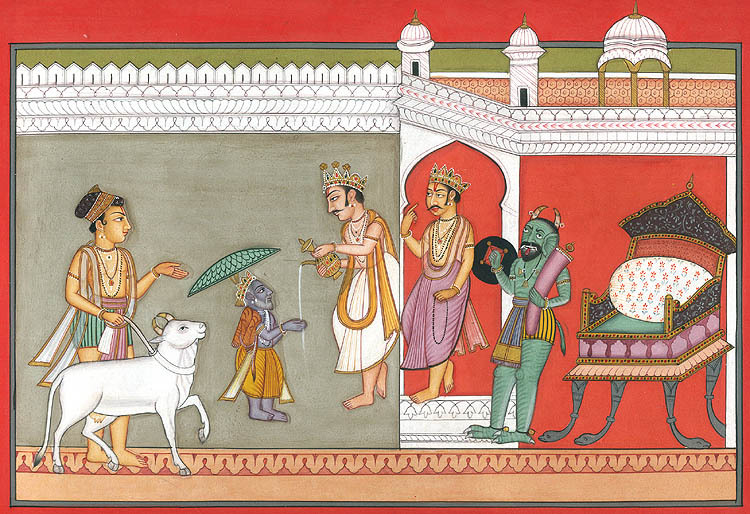 At the left stands an attendant lovingly holding onto an auspicious cow, signifying the traditional gift of a cow made to Brahmins (go-dana).